Start your children young on golf by giving them this six-piece Callaway Golf X Junior Golf Clubs. Encourage your child love for the game by providing him the apropriate equipment for golf. Available in small sizes only, the X Junior golf club set is an ideal gift that can give your child enough motivation to practice and improve his game. All the clubs in the set boasts of the innovation that Callaway Golf has been known for. The set includes a Wood, Iron, Hybrid, Putter, Wedge and a bag. The Top-Flite D2 complete set, provides every club you need for any type of green you’re going to be playing on. 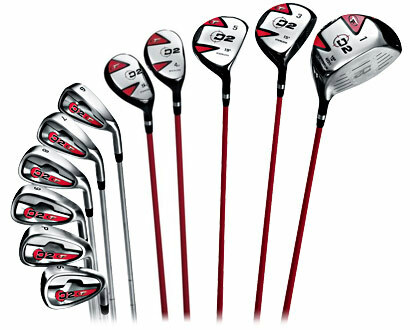 Features of the set include hybrids, lightweight stainless steel irons, and graphite shafts, even on the fairway woods. Winn grips on all of the clubs give you a comfortable and stable handle on your game. Another notable feature of these clubs, is the price. For off-set golf clubs of the quality and range that these offer, $399 is more than just affordable, its like hitting a hole-in-one.